I hope everyone had a great weekend. Last night we took Ethan with two of his friends to see Wreck it Ralph. What a cute movie, I think Scott laughed the hardest. I was able to make two videos this weekend. The first video is my Christmas cards that I will be sending out this year. This will be the first time I ever made my Christmas cards to send. I've never done that. Always said I was going to but never had the time. I'm heading out to do a little Christmas shopping today and making a little stop at the craft store while I'm out. I need some yarn to knit my awesome friend a scarf and some green satin ribbon for the front of my Christmas Album. Wow! Those are so cute....your family and friends will be so lucky to receive one of these cards! You are inspiring me to get going on mine! I have been doing Costco photo cards the past couple of years but I think this year I'll make a few handmade cards (I certainly have enough supplies! LOL!) to send to some. These are just perfect. What wonderful ideas, thank you for taking the time to make your video and share your creative process. Great job. I really like your cards! The scoring around the border is a neat idea. I get such inspiration from your projects. I need to visit papertrey ink's website. Those are adorable! Congratulations on finishing up your cards. I just finished mine, and now, about to make a few Thanksgiving cards. Love your videos, and you always share such wonderful ideas and tips. Thank you so much for all of the inspiration that you provide. 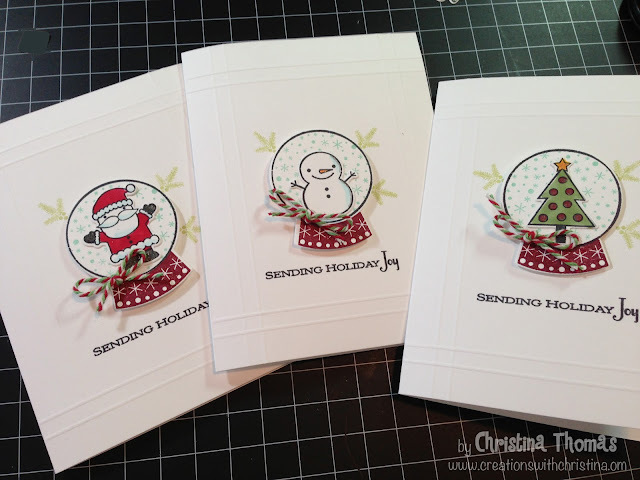 BethAnn M.
Wow Christina totally beautiful cards! I love the simple white background with the subtle score lines and that stamp set with the snow globe is the cutest! I'm going to have to invest in that set! too cute! Your cards are adorable. I try to make mine every year for "the masses," but sometimes I just don't have the time. What you've shown can be done over a few nights watching some TV, so thanks for the inspiration. Really a cute Christmas cards ..love the simplicity of it and still shows lots of warmth and effort. I love your cute and simple cards. What a great idea. Mine are all made since I've attended so many card making classes. It's so nice to have at least one Christmas chore out of the way. So Sweet. The red and green twine adds sooo much. Great job Christina! I love its simplicity, they are so cute. love these..... nice detail..... love Christmas in July!